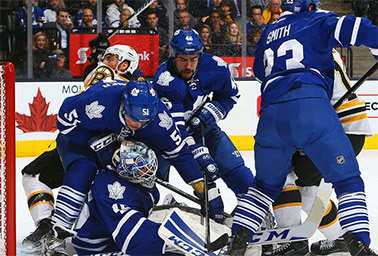 The National Hockey League shoots for zero carbon emissions -- a goal for other sports? The National Hockey League will significantly reduce its carbon footprint -- as well as the greenhouse gas emissions of its 30 franchise teams -- through improved energy conservation, detailed efficiency analyses and the purchase of renewable energy certificates (RECs) under a newly signed agreement with Constellation Energy Group, the league announced yesterday. The deal, which officials say brings the NHL to the fore among major sports leagues for its climate mitigation activities, will rely heavily on the use of Green-e Climate certified carbon offsets derived from wind energy and landfill gas-generated power, and RECs. These are attached to the power generation and sold in voluntary carbon markets as a means to generate more revenue for clean energy development. The new investment in carbon offsets and RECs should match the league's total greenhouse gas emissions, estimated at 550,000 metric tons, according to a league-commissioned report from the Natural Resources Defense Council and the Green Sports Alliance, a nonprofit that works with sports leagues on environmental sustainability. "Our sport was born on frozen ponds and relies on winter weather," NHL Commissioner Gary Bettman told reporters on a conference call yesterday morning. "Everyone who loves our game will benefit by taking an active role in preserving the environment and the roots of the game." Joe Nigro, CEO of Baltimore-based Constellation, an Exelon Corp. subsidiary, said the company was committed to providing the NHL and other customers with "sustainable energy options," adding that, "By promoting responsible energy use, the NHL is setting an example for the sports industry, fans and communities." Exelon, headquartered in Chicago, is a $31 billion energy services and wholesale power firm with one of the nation's largest nuclear fleets, as well as extensive holdings in natural gas, wind and hydropower generation assets. Are RECs the best path to cleaner energy? But the deal with Constellation will not necessarily involve direct purchases of wind power or landfill gas power to keep the league office's lights on or power chillers humming in NHL arenas. Rather, the NHL will invest in carbon offset projects and RECs, essentially credits that are attached to the clean energy generation instead of buying the energy itself, according to information provided by Constellation through a spokesman. Gary Bettman, commissioner of the National Hockey League. Photo courtesy of Wikipedia. Some climate organizations have been critical of companies that invest heavily in RECs, charging that the financial instruments are less effective at reducing greenhouse gas emissions than other measures. For example, firms that directly purchase clean energy, either by installing renewable energy systems atop office buildings or arenas, or signing power purchase agreements with a renewable energy producer, are much closer to the actual clean energy source than those who buy RECs, critics contend. Some RECs are also cheaper to purchase than others, depending on the type and location of the renewable energy generation. Critics say this leads some companies to "price shop" for the cheapest RECs, regardless of how or where the clean energy is produced, instead of taking concrete steps to reduce emissions close to home or constructing renewable energy infrastructure. But others believe that such criticisms don't always apply for large geographically diverse organizations like the NHL, whose carbon emissions are dispersed across more than 20 U.S. metropolitan areas and seven Canadian markets, from Vancouver, British Columbia, to South Florida. "Before they were just buying RECs to cover a small portion of their energy use," Warren Leon, executive director of the Massachusetts-based Clean Energy States Alliance said of the NHL. "Now it looks like they're trying to do significantly more." In fact, the new agreement will increase the NHL's investment in carbon offsets and RECs 32 times, from 17,000 metric tons of greenhouse gases in 2013 to this season's 550,000-metric-ton estimate. From the 2011-12 season to last season, the NHL's 30 teams lowered their emissions due to travel from about 105,000 to roughly 64,000 metric tons of released carbon dioxide. Officials said the agreement furthers the objectives of the league's 2014 sustainability report, which documented and disclosed the NHL's carbon footprint, and "NHL Green" -- a comprehensive sustainability initiative created by the league in 2010 to address the effects of climate change and freshwater scarcity upon ice hockey as a sport. The NHL is the first major U.S. sports league to undertake a complete carbon offset project, Bettman said, though the International Federation of Association Football, or FIFA, which serves as the international governing body for soccer worldwide, announced Wednesday that it offset all 331,000 metric tons of emissions from the this summer's World Cup in Brazil by financing offset programs. On a smaller scale, individual professional sports clubs, usually through their ownership groups, have pursued renewable energy projects, taken steps to reduce carbon emissions and implemented strategies for water conservation and solid waste reduction. In Los Angeles, the Staples Center -- home for two professional basketball teams, the Lakers and the Clippers, and the Kings, an NHL club -- saves on its utility bill with waterless urinals. That project began in 2009. Chase Field, where the Arizona Diamondbacks play baseball, has a 17,000-square-foot photovoltaic canopy, which was completed in April 2011. Suites in Levi's Stadium, the San Francisco 49ers' new headquarters, were lined with reclaimed wood, and concession stands serve locally grown fare. The Philadelphia Eagles have gone solar, too: Their field has a solar array that can produce more than 3 megawatts in capacity. Men at work, scrambling for a new goal. Photo by Graig Abel, courtesy of NHLI. Allen Hershkowitz, president of the Green Sports Alliance and a scientist at NRDC, underscored the importance of the announcement, calling the move "courageous" and "enormously important." "The announcement today reflects the most important environmental issue ever announced by a sports league globally," Hershkowitz said. "No other league has come forward and said, 'Here's our carbon footprint.'" The NHL and Constellation will promote energy efficiency at key hockey games this year, including the playoffs, the all-star game and the Winter Classic, an outdoor event on New Year's Day. 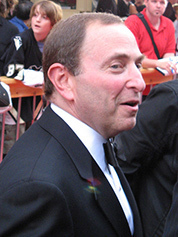 "Sports leagues are a perfect vehicle" to address climate change, said Bettman, noting that steady global warming is an international concern. "Sustainability really doesn't know borders," he said.